Welcome to my blog dear hoppers! If you arrived here from Nana Donna's Card Dreams then you are heading in the right direction! If not then you will need to go to She's A Sassy Lady blog and start the hop. I hope you are enjoying your trip down the RED HOT lane today and enjoy all the projects everyone has made for this hop. I would like to thank Celeste with Thirty OneGifts for sponsoring our hop and making such a fabulous prize available! A winner will be drawn randomly from one of the blogs in the hop so make sure you comment on each one both days of the hop! I will be offering a prize from my blog and you will have to read to the end to find out how to win and what prize I am giving away. 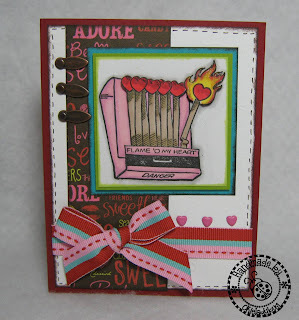 My project for today is a red hot Valentine's Day card. The image is one that I got from my friend Linda, aka LGuild, last year. She was nice enough to stamp a sheet of them off for me and then scan them. I did enlarge the image a little for my use. I used ProMarkers to color two images. On the flame I started with my red, lightly outlining the edges. I then went in with an orange and the colored the entire area with yellow. I also added some glitter with the Stardust Gelly Roll pen giving the flame a little sparkle. I cut one of the images so I ended up with just the matches and the bottom of the book of matches. I glued the bottom of the matchbook directly on to the bottom image and then added pop dots to the matches. To enter the giveaway for the prize of ProMarkers on my blog just leave a comment on this post and I will use Random.org to choose a winner. Comments will be closed on Monday morning at 8am. Don't forget to hop along tomorrow also. I will have another little project that is Red Hot! To continue on the hop just click the button below and don't forget to leave your comments along the way to be eligible to win the prizes. I just love love it!!! Great stamp and wonderful coloring! OkieLadyBug: Your matchbook card is SMOKIN HOT (sorry-couldn't resist posting that). Love how you colored in your image-amazing. TFS! Love your red hot Valentine's Day card! I especially love how the matchbook stands out! Thanks for sharing! Love your card and your image! Cannot wait to see what you post to tomorrow. We are very excited you joined in on our hop! I love the matchbook! Your coloring work is great! OMG Okie, this is adorable, I love that stamp,ehm (hint hint) Beautiful card. Okie it is wonderful and how perfect is that for our "red hot" theme. I love that image. I am so glad you joined us, now let's get this party rollin! This is just too hot to handle! I love it. Great work as always. Thanks for the chance to win. Okie, I come to your blog daily just to get a lift to my spirit. Your bubble and happiness just seems to jump from the screen into my 'heart'. Blessings to you, and I LOVE that RED HOT valentine. Very nice you did a nice job tfs!! Cute card, great coloring, tfs! I think this would be a great card for a hubby! Love your card - so creative! Thanks for sharing. Love that image--great job coloring it!! Love your card. Has your humor written all over it! Okie - this is so perfect for the hop! Love the little heart matches...Gorgeous color and a fantastic layout!!! So happy you were able to join us!! What a cute card!! Great job on the coloring! I love your card!! It's definitely red hot!!! I'm going to enter and enter and enter until I win some dang promarkers lol!! What a cute card! So unique and I love that image! Cute Cute Cute! 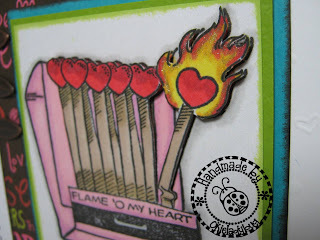 Love the flaming heart! So cool. Thanks for the chance to win!! What a "hot" card!! Love it!! That card is RED HOT! What a cute idea! You're coloring is flamin red hot! Love the bright colors. Can't wait to check in with you tomorrow. I love the card, very Cute!! TFS!!! What an adorably HOT card!! Love the coloring you did! I really like the way you popped the matchbook, creative! The card turned out great! You always amaze me with how you think out of the box. Cute, cute, cute card! This is such a great card! Love Love Love the Matchbook! We are so excited that you are in the hop with us! Thank you SO much for playing along! Very cute card. Love the matches. Too cute. Love the colors and the sentiment. Thanks for sharing. Cool stamp and very cool card. This is too hot to handle! Thanks for sharing. That is the cutest card. I love that stamp. What a cute card! I'd love to give something like that to my DH. TFS! been wanting to try pro markers! Okie - I love your card and would love to win the Promarkers!! Really cute card. Nice coloring too. Okie-you Enabler! (yes, I CAPITALIZED IT! teehee!) All your posts with the ProMarkers keep making me want to get them..... Now where did I put my credit card.....hmmm..... Thanks for all your wonderful projects! Wish everyone could see this card in person! The photo just doesn't show the dimension on the cardfront. It turned out really, really cute! How clever Okie to use this image, perfect. And you just reminded me of what I have been wanting to try, and that is to stamp and image, scan and enlarge!! Hello!!! Thanks for the chance to win some ProMarkers. Cool prize!! Great card, love the matches. The promarkers colored them beautifully. Thanks for being part of the blog hop, its been fun. Cute idea. Thanks for your time and your trouble. 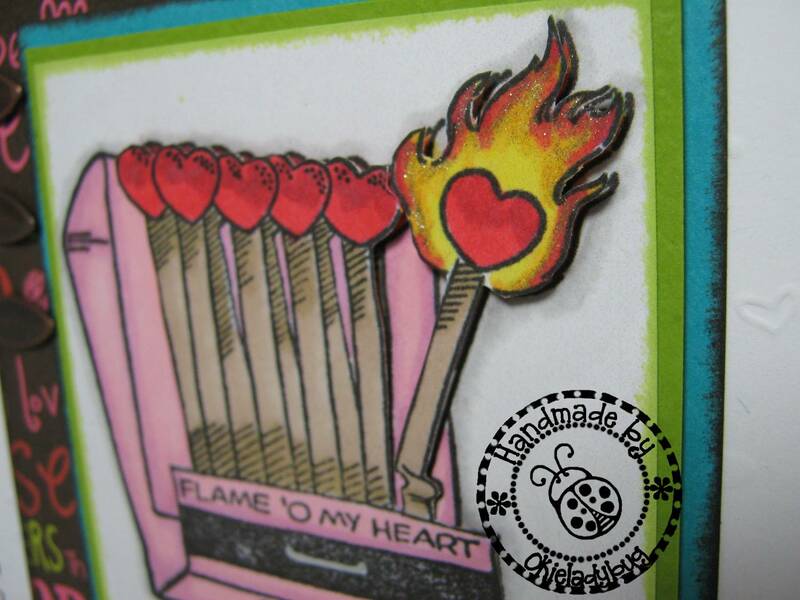 Hello red hot...I just love this stamp! So so cute! Thank you for the chance to win! Wow, you did a great job coloring this! Would love to try out those markers! Love your card, love your blog, love your sense of humor!! And thanks for the chance to win! I love the card and am really getting inspired to get going on making some myself. I would love to learn to color with the promarkers! Thanks for the chance at the give-a-way. I hope to be the lucky one. I love the matchbook stamp set! I also enjoy reading your personal *comments*!! They always crack me up!! Thanks for a chance to win some goodies and for all your inspriation!!! I never would have thought to separate the matches from the rest. Fabulous! Love the Pro Markers! Really make the images pop on this card! Sensationally sizzeling, your card is fabulous!! Would love to trade in my Crayolas for some ProMarkers! Great card, but yours always are! That is hot Okie!!! Thanks for sharing your projects! Thank image is so cool I mean hot. I love it and I never saw it before. Great card. What a great idea to stamp, scan and enlarge. I never thought of that. I use to do that all the time with clip art when I was teaching. that is an adorable card, i love the image! Such a cute card love it. I can't wait til I get this good. beverlymefford197@gmail.com. The "stamped" image is perfect. I really like the dimension of the matchbook. A super sizzlin' card! very nice. Your cards are always colored beautifully. I love the match book ~ great coloring! That is a great stamp. Glad you had it scanned in so we got to reap the benefit of seeing such a cute card. OMG! This is too cute!! Thanks for sharing your creativity. OMG!!! I LOVE that STAMP image!!! I have never seen it before and I just LOVE IT!!! Your card is fantastic!!! great card! I have enjoyed this blog hop so much andlook forward to the next one. Great card and so original. oh i love the stamped image. never seen one like it. i like how the image pops out too. great work. Love the stamp and sentiment! Thanks for the chance to win! OKIE, YOUR CARD 'LIT UP' MY DAY! SORRY IT'S LATE AND I COULDN'T THINK OF ANOTHER 'HOT' LINE! I love coming to your blog. I love to see what you have made and what you have to say. You make my day! You are one creative lady! Love, love, love your blog!! First time I've come across it & I couldn't stop reading! You are SO creative & funny! I'm glad you have so much fun doing this... it shows! Your card is amazing!! I love all the details you added. I will be back for more inspiration! Have a great day!! Are cruises are suppose to be relaxing? What the HEEL is wrong with me?